Losing weight is definitely a challenging task, but not an impossible one.Balancing your exercise and eating habits will help you maintain your new weight. Once you reach your target weight, it is important that you follow certain principles so that you do not get back to your earlier weight. Continue following the basic weight loss principles that your health expert has prescribed for you during the weight loss program. If you wish to eat sweets and other high calorie foods, do so slowly. Do not eat all of these on a single day. It may lead to over eating. Also, keep a watch on your current weight, as you may have to maintain the same. Eat a variety of foods to get all the nutrients you need. Include choices from whole grains, fruits, vegetables and lean protein sources. 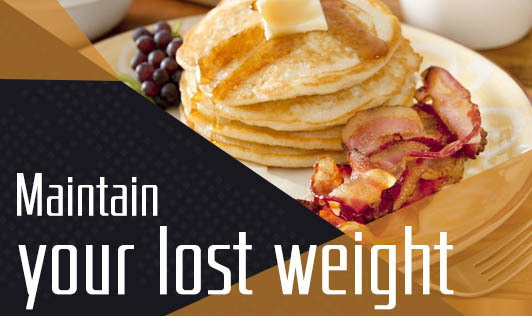 Do not skip meals to lose more weight or inches. Your metabolic rate might drop when you skip meals, and it might also lead to over eating later in the day.Maintain a good eating schedule and stick to the same timings as much as possible, daily. Make sure to exercise without fail. Exercise for 4-5 days a week for at least 40-50 minutes to maintain the weight. Remember, exercise is the key to maintain the lost weight. If you are aiming for inch loss after weight loss, then exercise is the best method. It’s good to maintain an exercise and diet diary during a weight loss program. It can act as a good reminder of your progress, motivate you to do better and keep you conscious about your eating pattern and exercise regiment. If you were following an unhealthy eating pattern, make sure you don’t get back to it. Make the right food choices and be conscious of whatever you eat. Monitoring your weight once a week or once a fortnight will help you know if you are gaining weight. Stay positive and you will gradually adopt a healthier way of life.